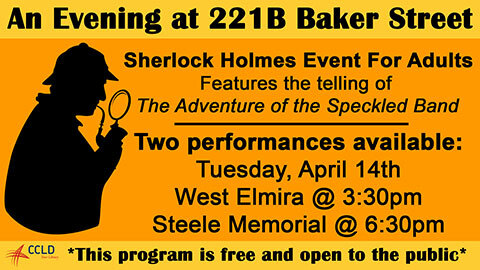 This entry was posted in Steele, Uncategorized and tagged adults, alzheimer's, computer classes, events, exercise, fitness, national library week, programs, sherlock holmes by ccld. Bookmark the permalink. ← Previous Previous post: Bookmobile is still seeking entries for cookbook! Next → Next post: View genealogical records from all over the world right in downtown Elmira.